Hey there! It is the middle of June and that means that it is summer time! (It’s been summer in Arizona for a couple of weeks already.) Summertime means sleeping in, days at the beach, and summer classes! Yes, summer classes. I know the last thing a college student is thinking about is taking summer classes and back in high school summer school was the literal worst thing ever. But summer classes in college aren’t that bad. I took summer classes one summer when I was at ASU and it helped me graduate a semester early. Besides helping me graduate a semester early, I was able to take classes that I thought were interesting that I wouldn’t have been able to take during the semester. I took a Web Designs and Development course (that I blogged about) and a business course on baseball (my favorite sport). The best part, they were online classes so I didn’t have to go to campus or sacrifice my summer time. You can get ahead in your degree. Now, like I said, that doesn’t have to be the only reason, it doesn’t have to be a reason at all but it can be a reason. If you already took extra credits during the semester (18 vs 15/16), then one or two summer classes might bump you even further ahead. That’s what happened with me. I took a full load every semester, took two summer classes and then when I went to do my fall schedule, my advisor said that would be my last semester. I didn’t even know that I was going to be done early. Even if it doesn’t make you graduate a semester early, it could still help you lighten your load down the road. No one wants to take a full load for their last semester. Taking two summer classes could help lighten the load and help you focus on your capstone, or equivalent senior project. I suggest taking online summer classes. I’m so glad that the classes I took over the summer were online classes. I worked through most of my college classes, but I also would take trips over the summer, especially our annual trip to Lake Tahoe in July. Online classes allow you to still enjoy your summer, take the vacations you planned, and have days off at home staying cool. Plus, online classes can generally be easier. Even if the subject matter isn’t necessarily easy, being able to do the work on your time during the week makes it easier. When taking online classes, you’re not limited to an hour in a classroom. Usually, modules are by week and you can work out when during the week to learn the material. You can learn something new and exciting. I found that a lot of interesting classes are offered over the summer. 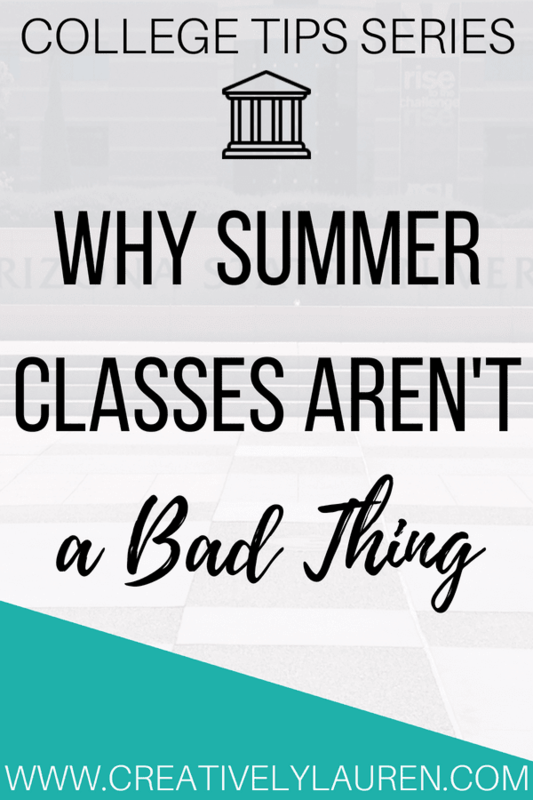 If you aren’t trying to get ahead, or there was a class that you saw was interesting but didn’t fit into your schedule, then take it over the summer. During the summer you have time to focus on an interesting class when you might not during the spring or fall semester. So, don’t be scared of summer classes, they aren’t that bad. They offer flexibility and interesting subjects! They shouldn’t be looked down upon like high school summer school. Have you taken online classes or are you thinking about it? Let me know in the comments! I love this! There's so many good reasons to further your learning and the summer is such a good time to do it! THank you, I agree! I love finding something interesting to learn about!